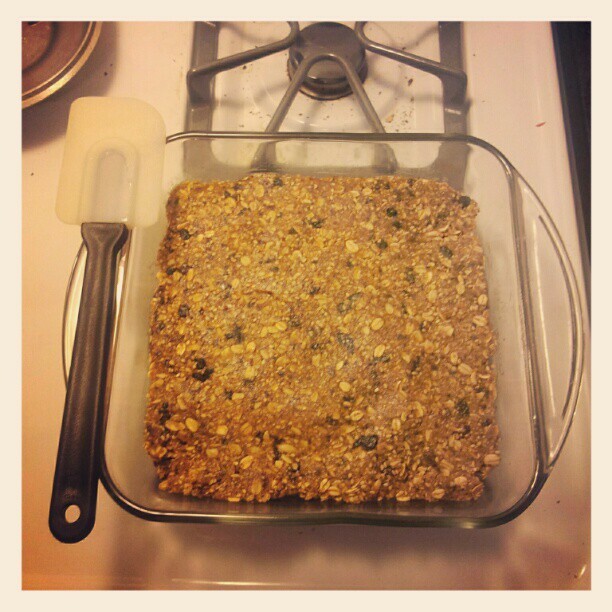 Granola bars have long been a comfort food of mine. When I could find nothing else in a store which would offer me the necessary balance of sweet, filling and marginally nutritious, I gave my trust over to Nature’s Valley or Kashi to hold me until an actual meal appeared. The flavorful combustion of oats, nuts and dates bonding within a sweet bath of honey or peanut butter was the perfect snack for bypassing breakfast or rejuvenating from a late night of dancing en route towards home. This didn’t stop me from being dismayed by a review of the ingredients where corn syrup, a high sugar content or esoterically named fillers and binders stared back at me accusingly. As my discomfort grew, I did what I have become accustomed to doing recently when I don’t like what the world has presented for me. I began to investigate ways of making my own. Fortunately, it wasn’t long before I had stumbled across this glorious concoction from the Whole Grain Gourmet. On my very first attempt at constructing a batch, I knew we would be fast friends as I scarfed it down by myself within 3 days. The second batch was shared amongst the Healthy Food Hub community who queried if I was selling treats. While I haven’t made another batch in a few months, I am confident enough to know that when I need trail food for the next Aya Leadership Development camp or field outing, I can pack a layered container of these high fiber bars and have no worry of a drop in peak energetic potential. This recipe is partially responsible for the fact that I am never without a healthy supply of nuts and dried fruits in my pantry. They have come to make themselves useful in all manner of other kitchen experiments. Combine apricots, cherries, currants, and blueberries in a food processor. Pulse to mince, being careful not to allow it to paste up. Add minced dried fruit, oats, almonds, and sesame seeds to a large bowl and mix well. I use my hands to gently roll the mixture, getting the dried fruit to separate from itself and blend with the oats. Bring 1/2 cup of water to a boil in a small sauce pan. Add the 7-grain cereal, stir thoroughly, and remove from heat. Allow it to rest in the pan for 2 minutes. Add peanut butter, honey, salt, and vanilla to the pan and return to a medium low heat, stirring frequently, for about 7 minutes. You want the mixture warmed throughout and well combined. The mixture will begin to glisten and roll off the sides as you stir it. Do not overheat the mixture as you will need to be able to handle it. Add the peanut butter mixture to the oat mixture and combine thoroughly. Work it with your hands to combine well. Firmly press the mixture into a 8×8 glass baking dish. Don’t be shy about it. You want to compress it into the bottom of the dish so that the top becomes level. I use a flat metal spatula. Allow the dish to rest at room temperature for two hours or longer. The longer you wait, the firmer the bars will be when you cut them. Cut into bars and enjoy. The bars should be firm enough to retain shape, but will give to pressure.